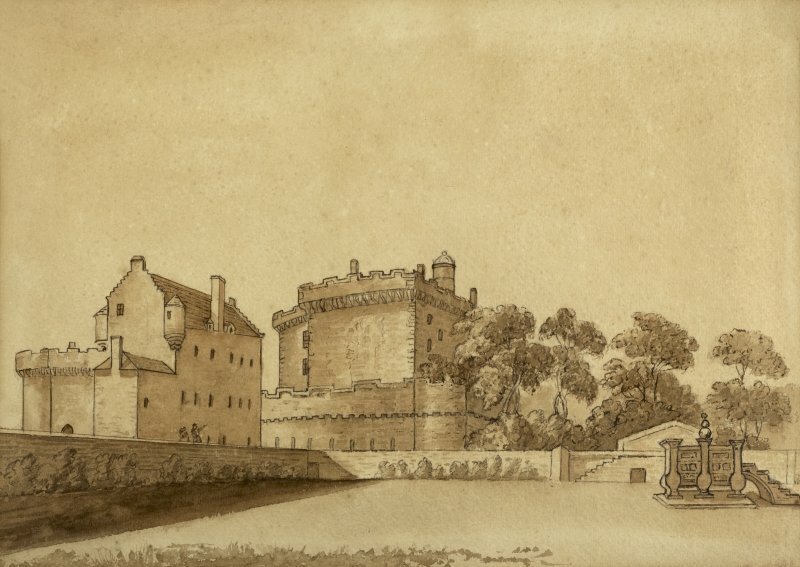 Drawing of 17th century house, since demolished, as seen from North. 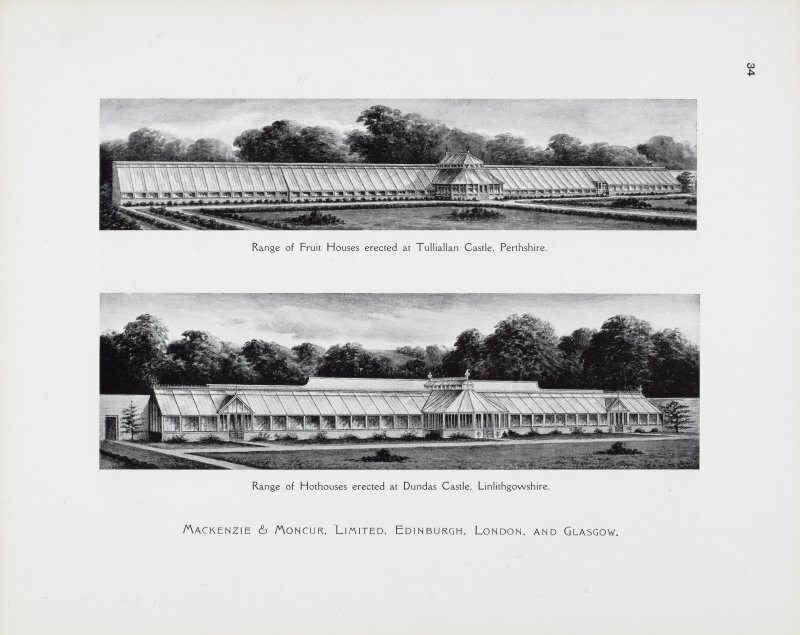 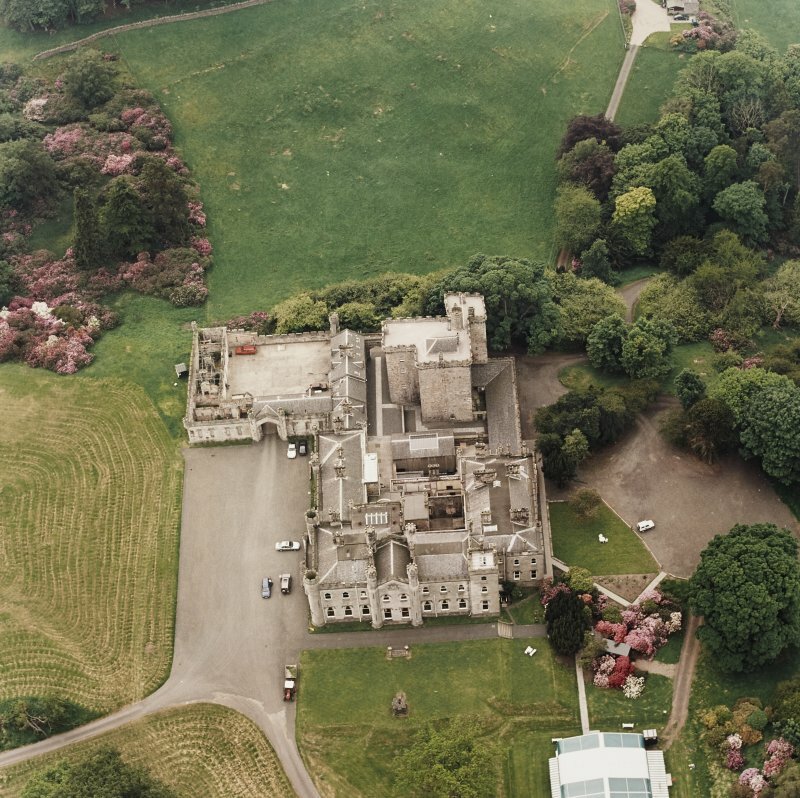 Oblique aerial view centred on the country house, taken from the S.
Catalogue of Horticultural Buildings by MacKenzie and Moncur. 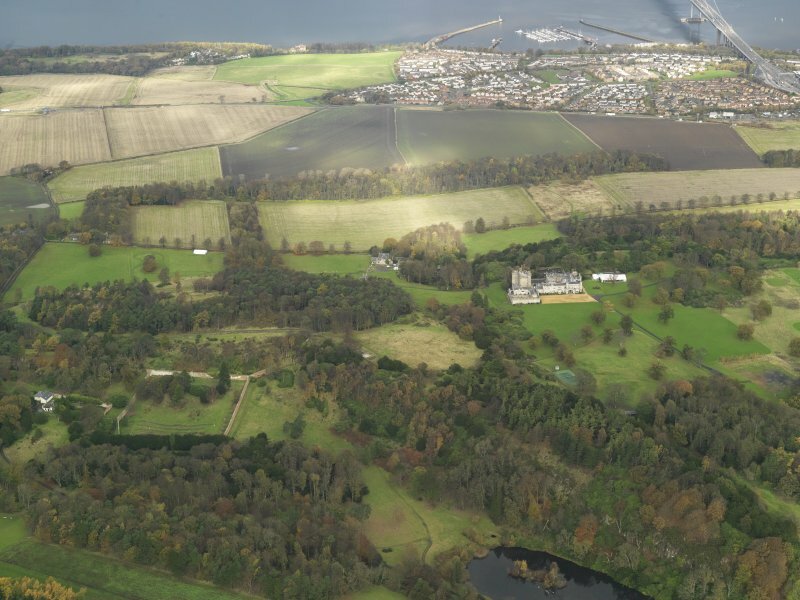 "Range of Fruit Houses erected at Tulliallan Castle, Perthshire" and "Range of Hothouses erected at Dundas Castle, Linlithgowshire"
General oblique aerial view of Dundas Castle, Dundas Park Golf Course, Dundas Loch, Dalmeny, looking NW. 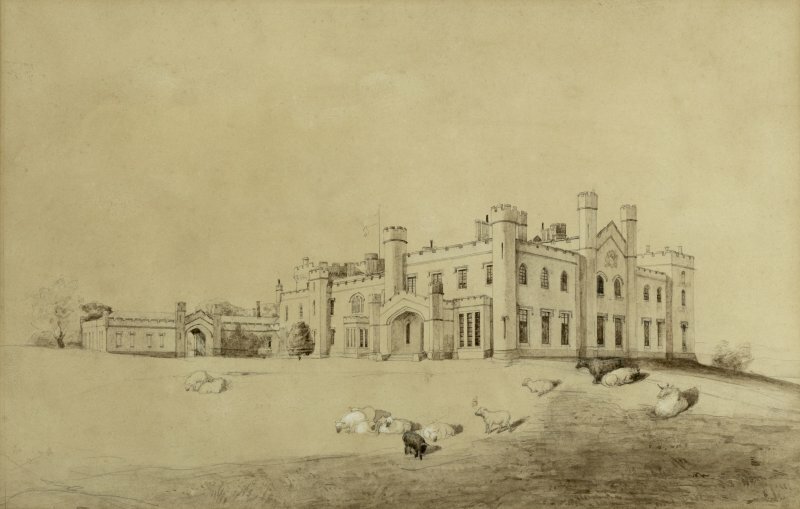 Drawing of 17th century house, since demolished, as seen from North. 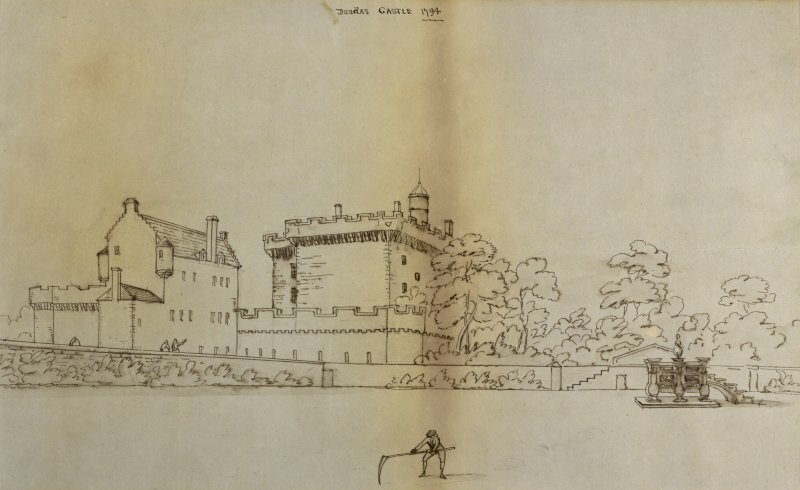 Very similar to an earlier David Allan drawing. 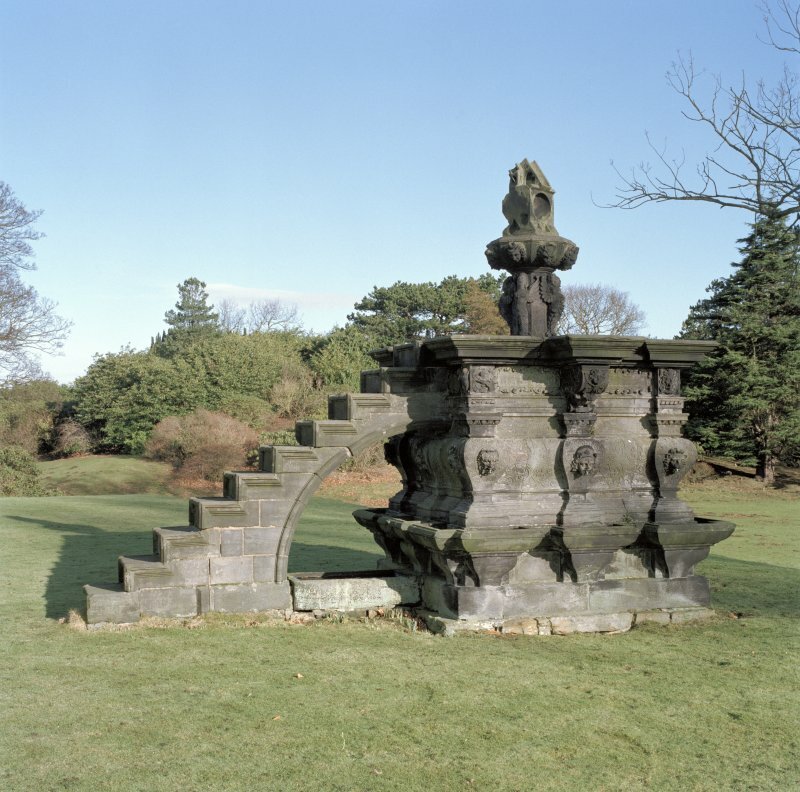 Mansion, garden, fountain, view from South South West. 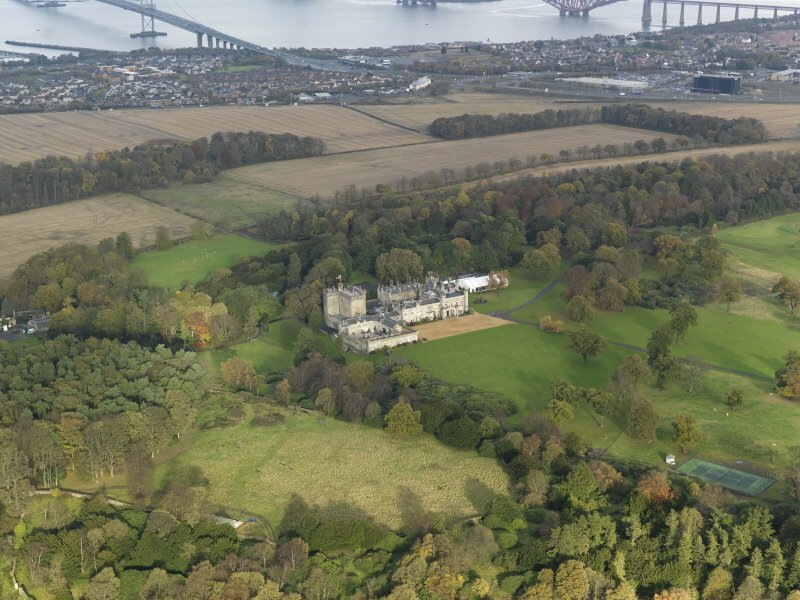 General oblique aerial view centred on the castle, taken from the SSW. 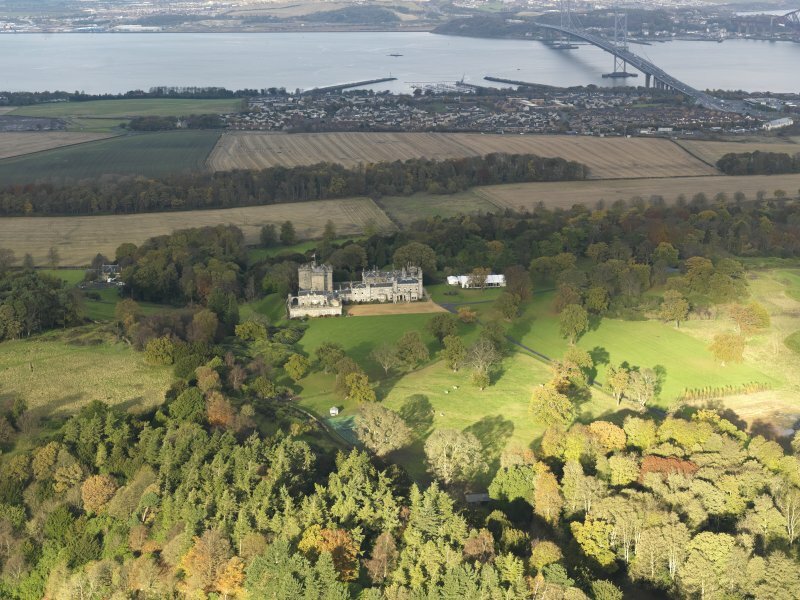 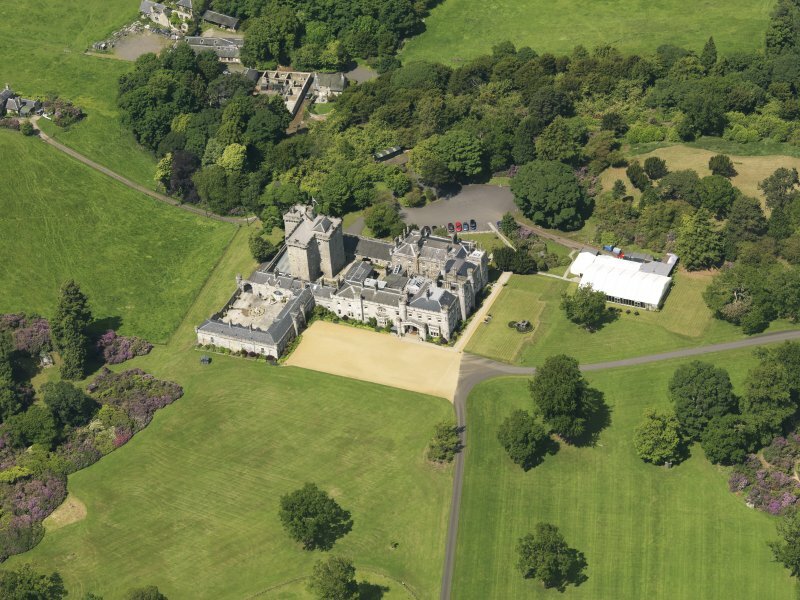 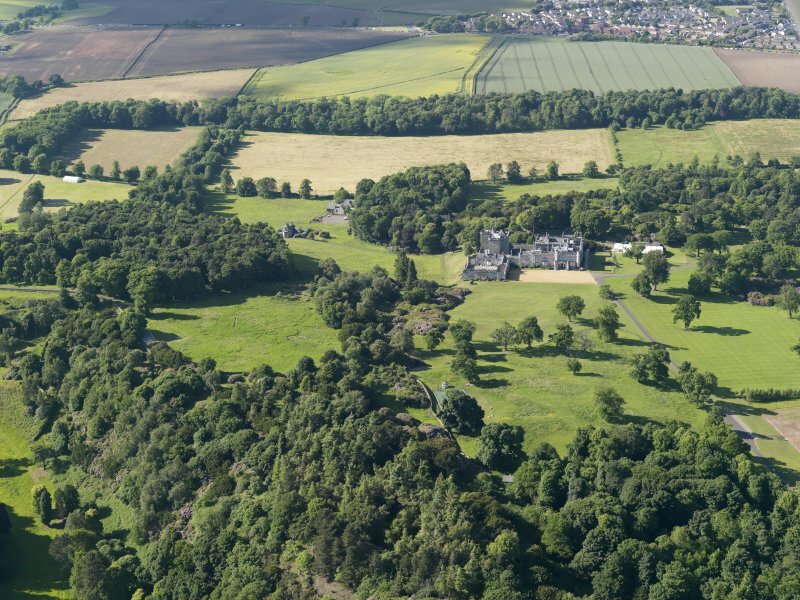 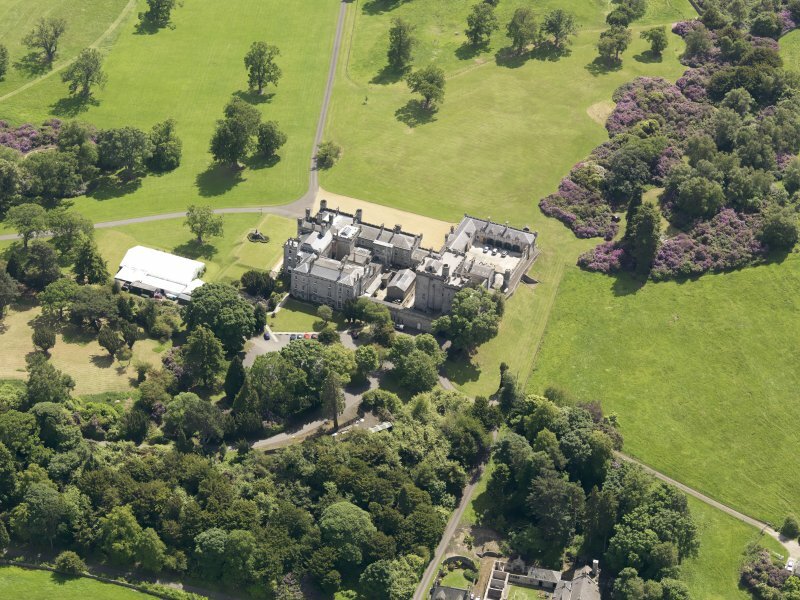 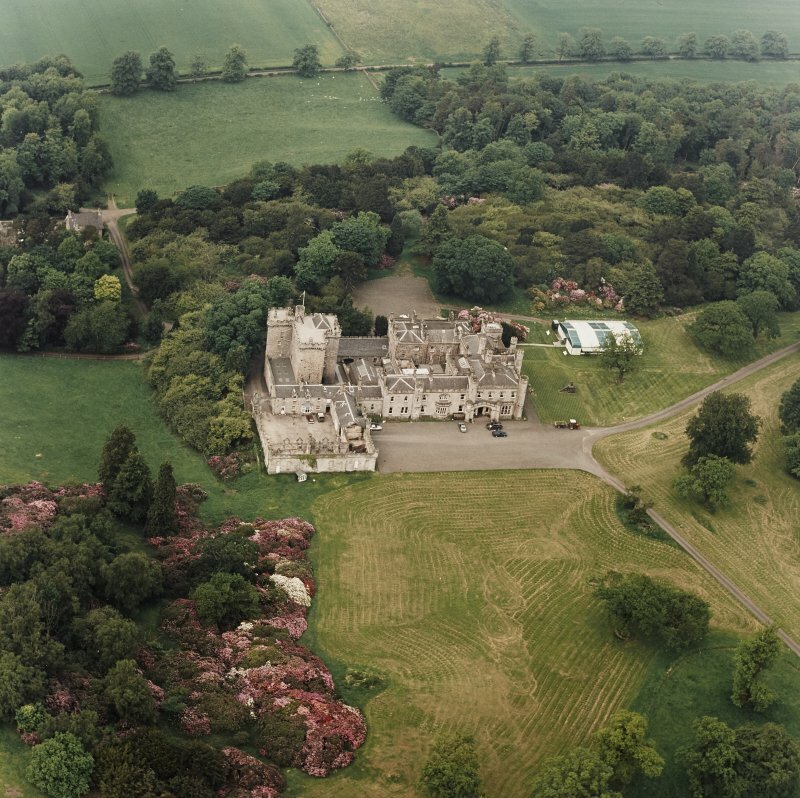 Oblique aerial view of Dundas Castle, taken from the NNW. 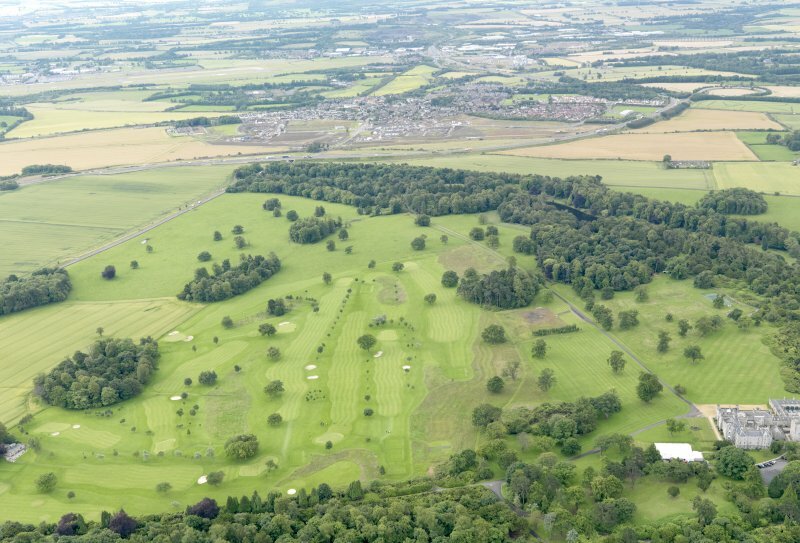 General oblique aerial view of Dundas Park Golf Course, taken from the NW. 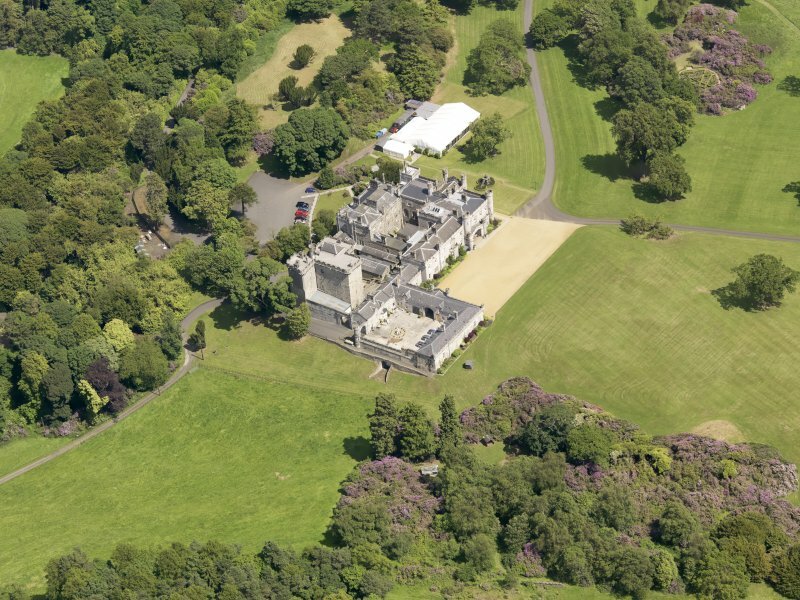 Dundas Castle View of old castle from South West. 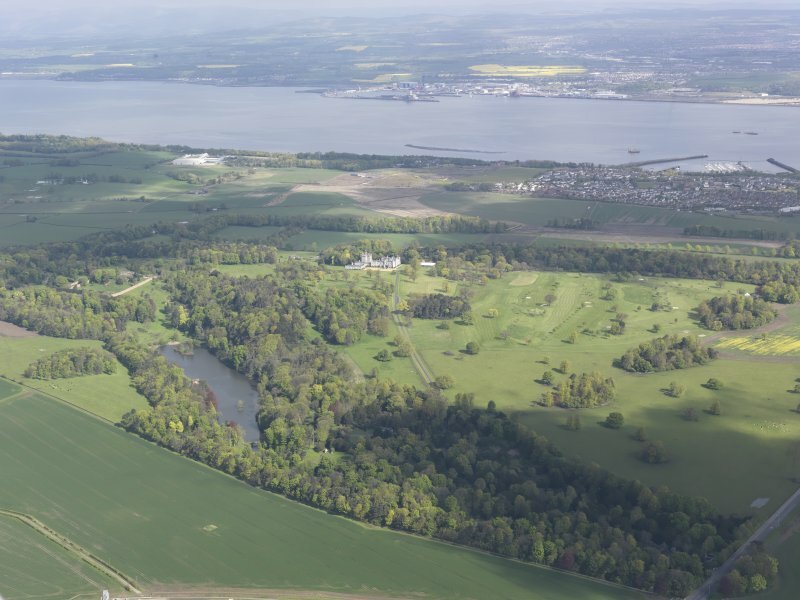 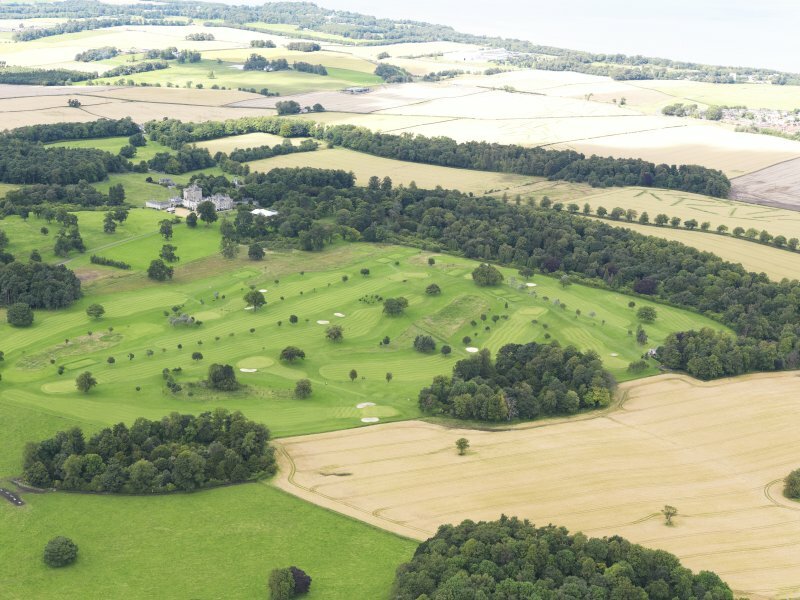 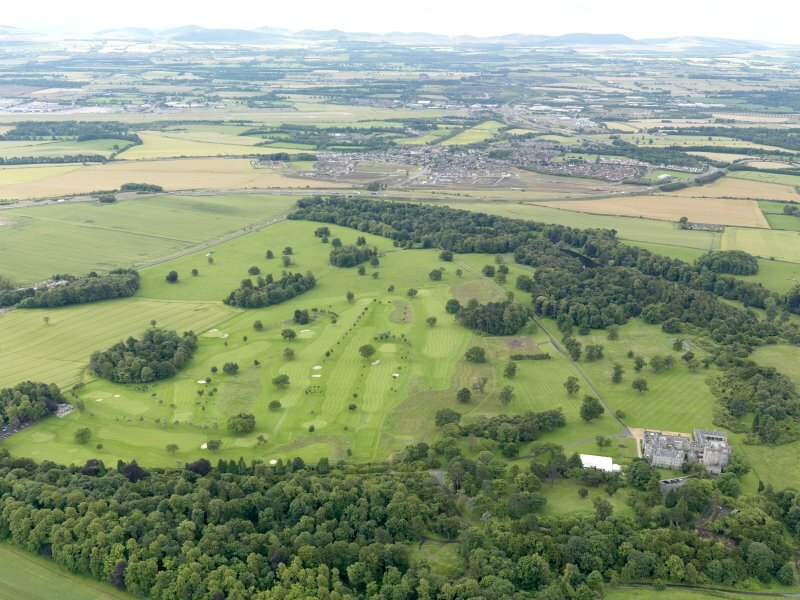 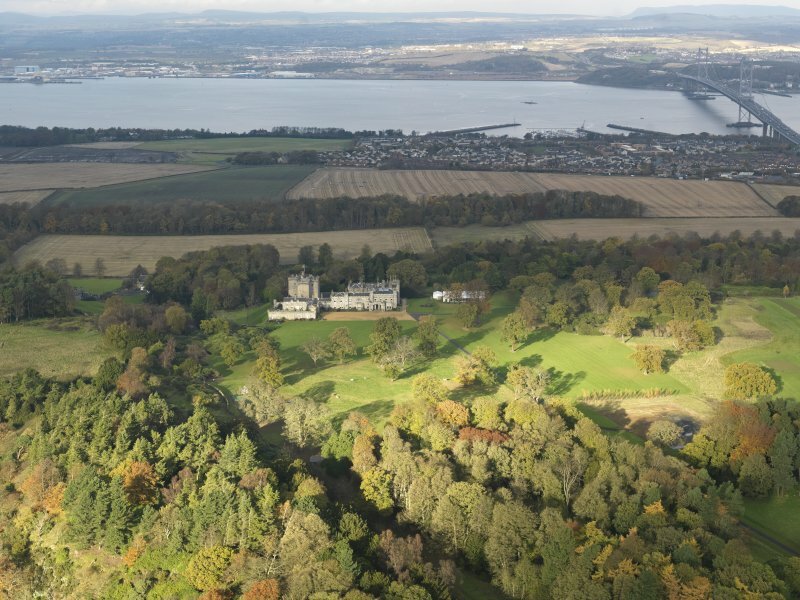 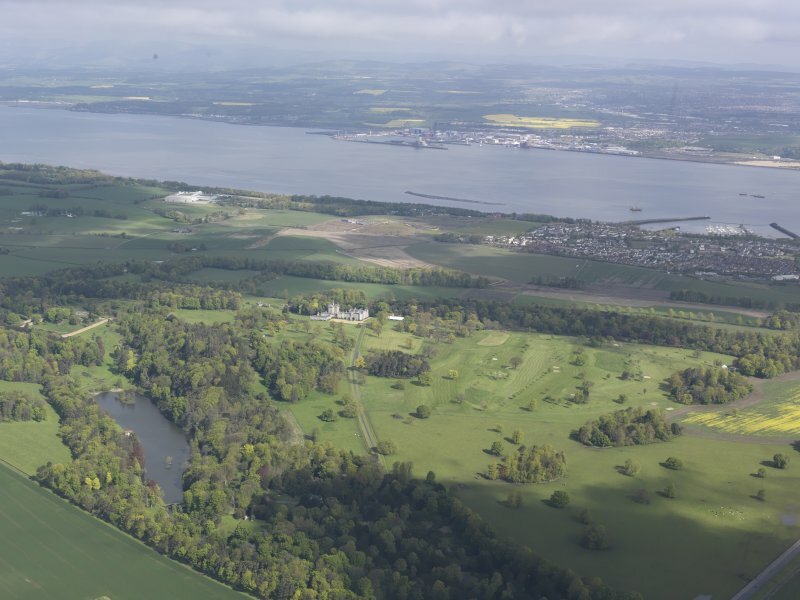 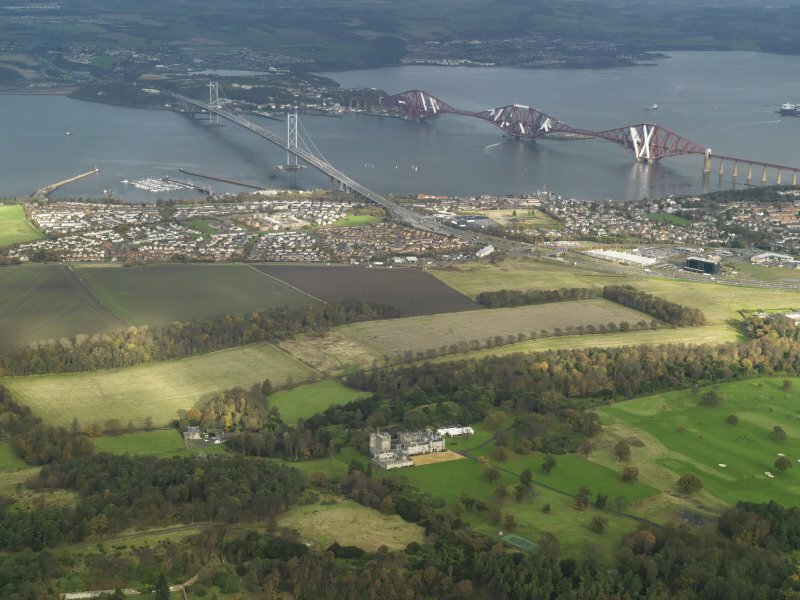 General oblique aerial view of Dundas Park Golf Course with Dundas Castle beyond, taken from the SSE. 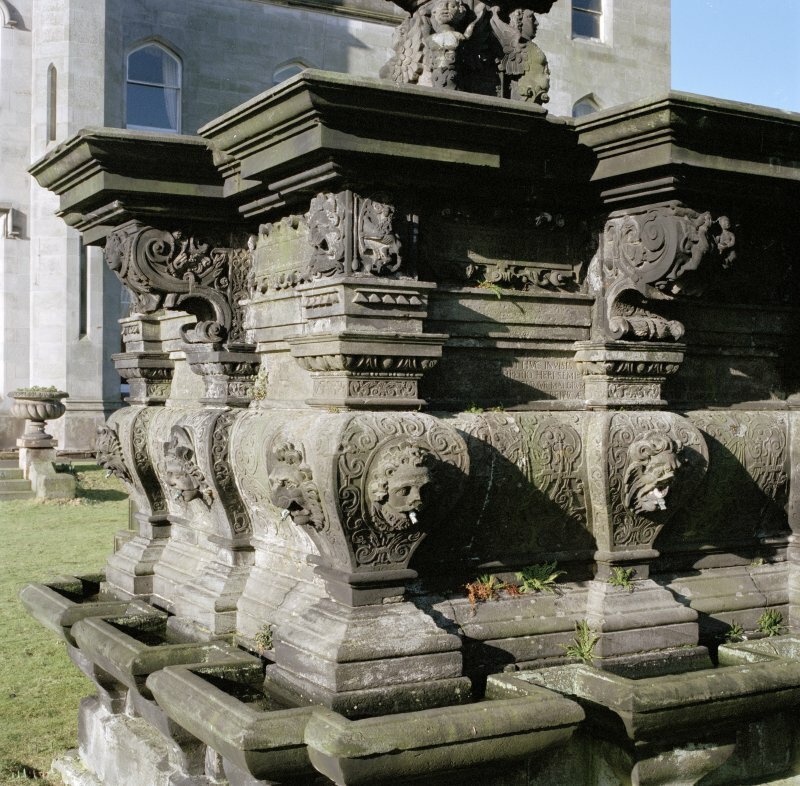 Mansion, garden, fountain, South East corner, detail. 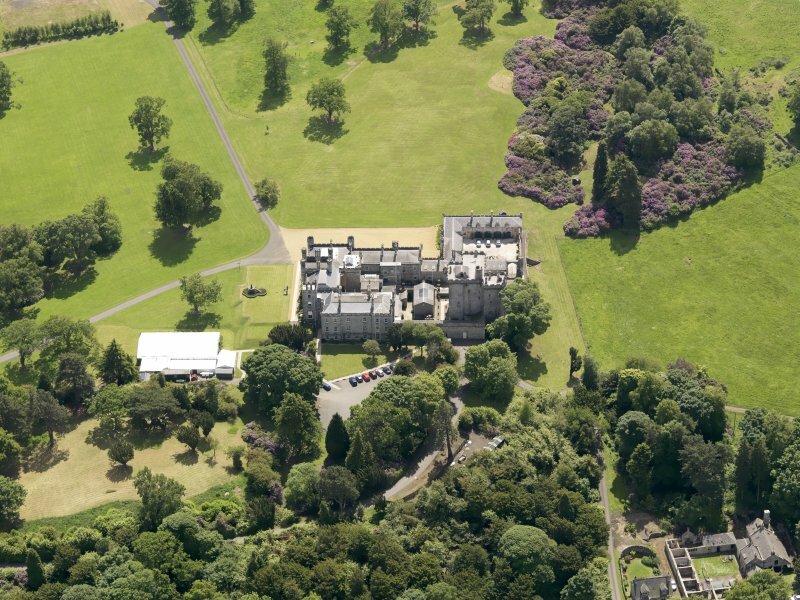 General oblique aerial view of Dundas Castle country house and policies, taken from the S.
Oblique aerial view of Dundas Castle, taken from the S.
General oblique aerial view of Dundas Park Golf Course, taken from the NNW. 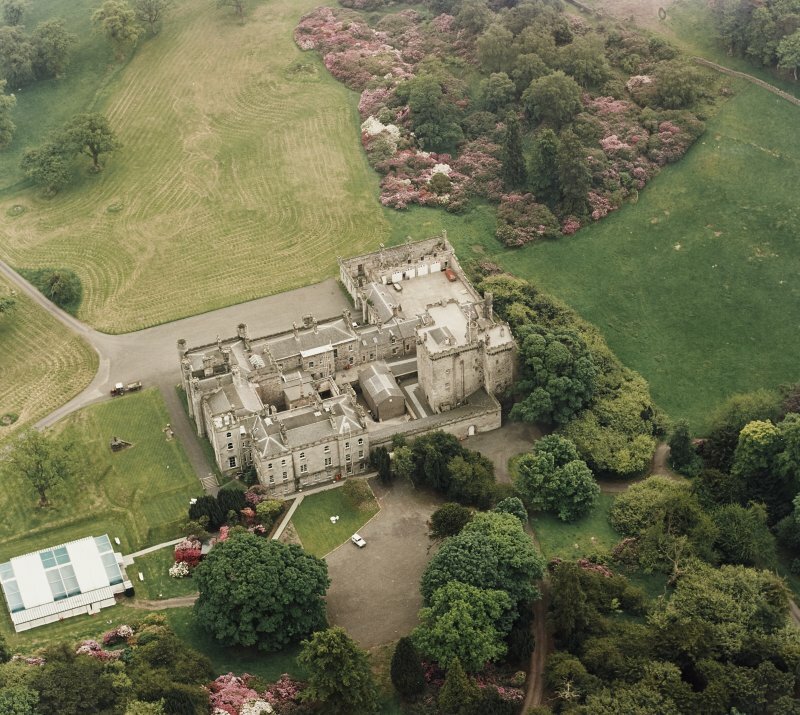 General oblique aerial view centred on the rail and road bridges, taken from the SW.
Oblique aerial view of Dundas Castle, taken from the SW.
Oblique aerial view of Dundas Castle, taken from the N.
Dundas Castle: Adjoining the offices of the mansion built in 1818 is a 4-storeyed, L-shaped tower, built c. 1416 to which a second wing was added c.1424, projecting from the NW angle. 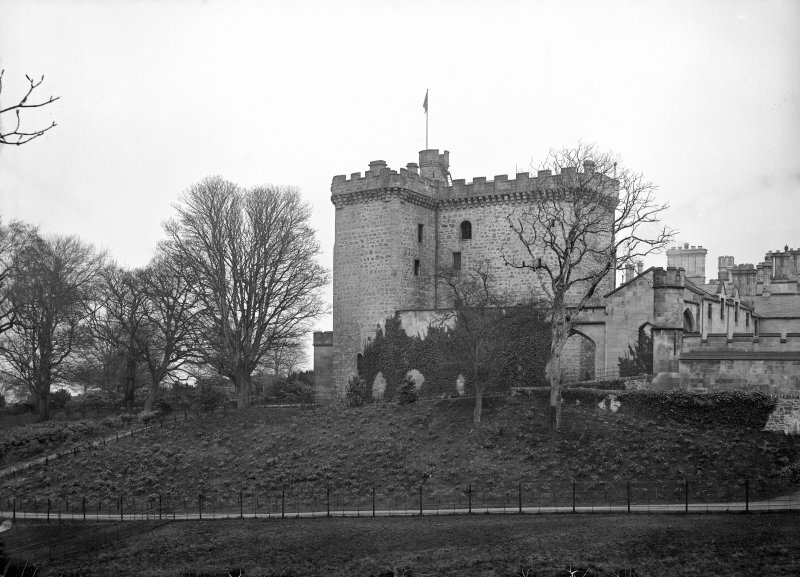 The rubble walls of the tower are surmounted by a 16th century crenellated parapet. 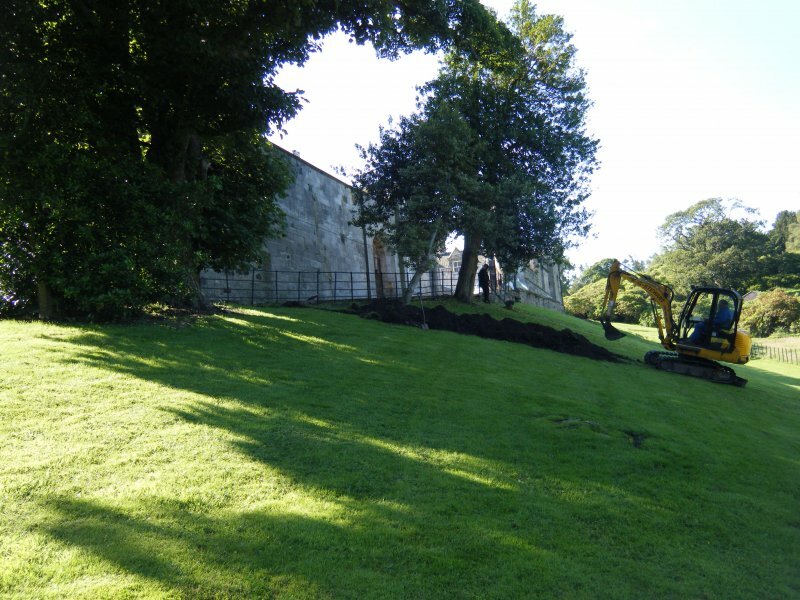 The tower is in a good state of repair, though much altered internally, having been at one time converted into a distillery. 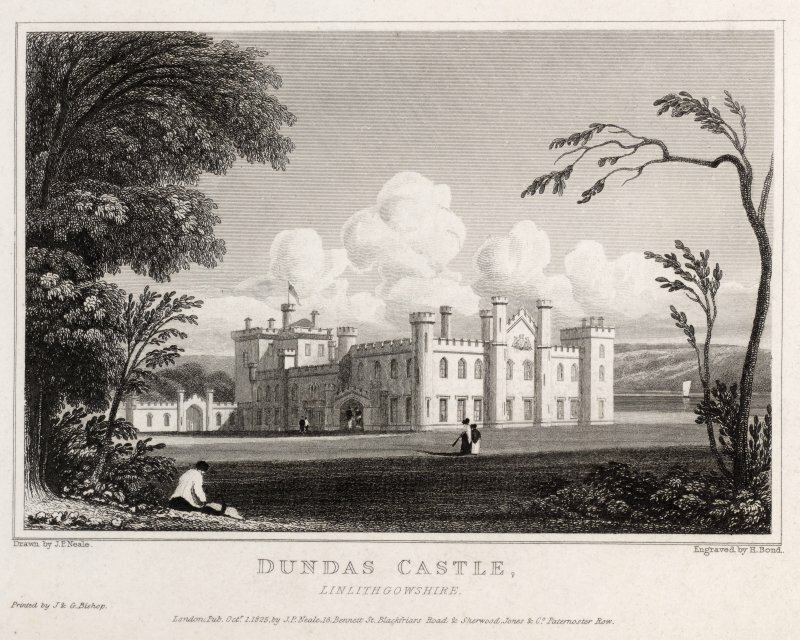 The lands were in the possession of the Dundas family from c. 1120 until 1875, when the estate was sold to James Russell. 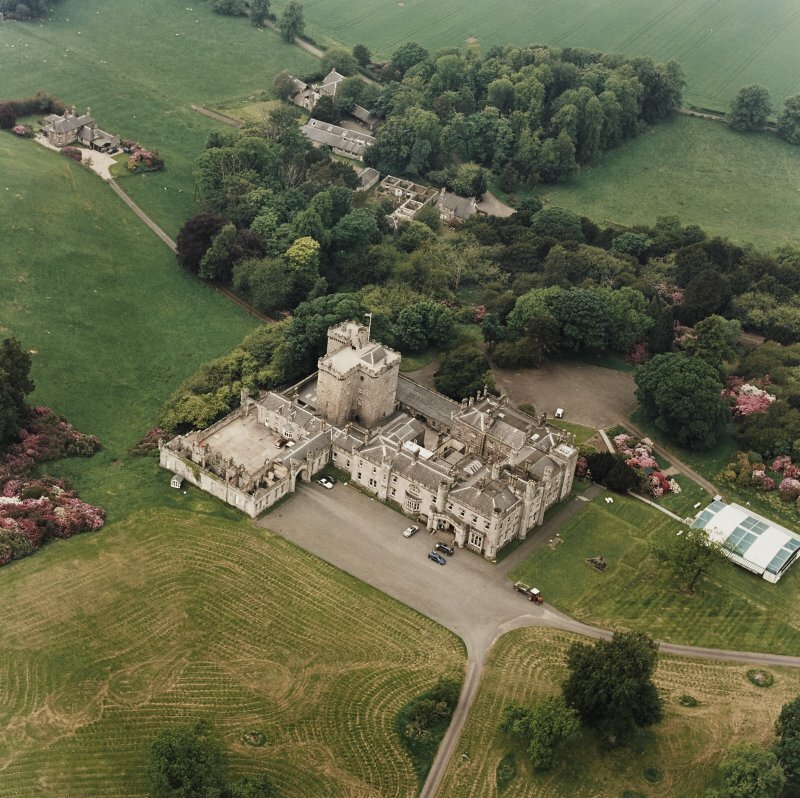 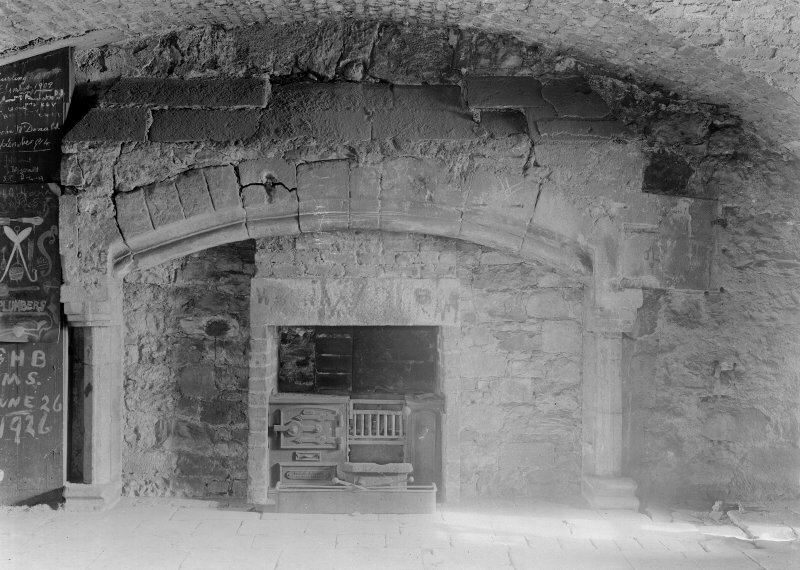 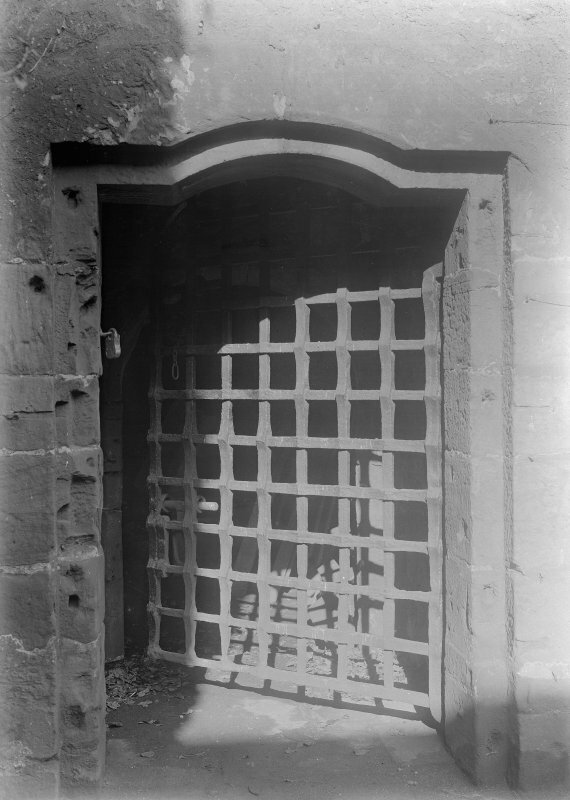 The castle was beseiged in 1449, and is said to have been visited by both Charles II and Oliver Cromwell in 1651, though it does not seem to have been involved in the hostilities at that time. 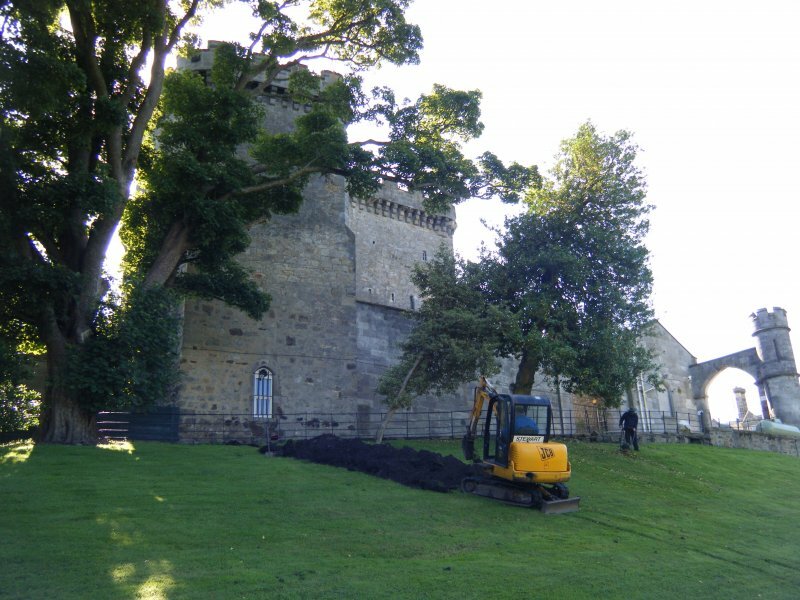 This tower is as described and is in a good state of repair. 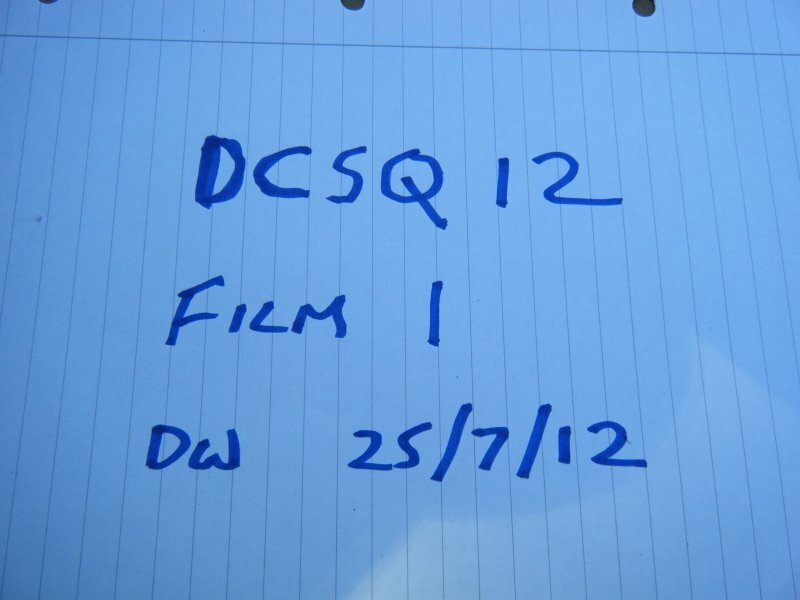 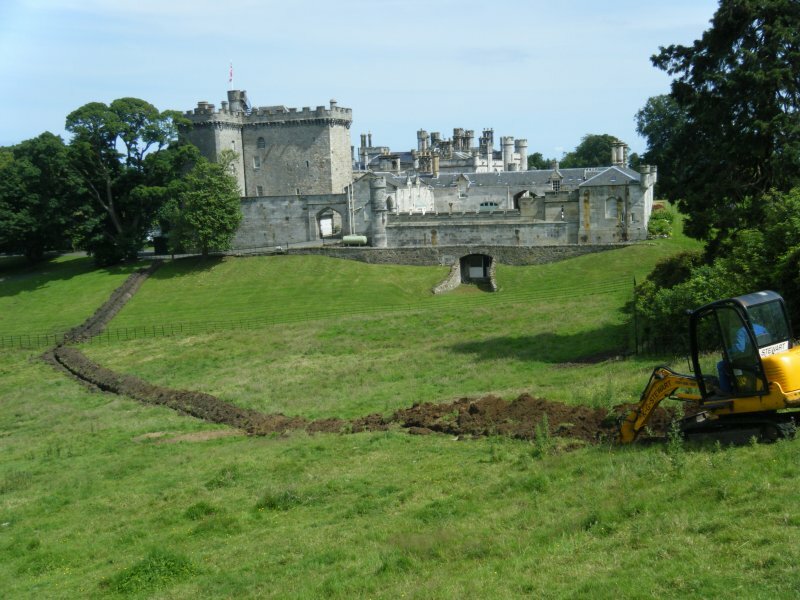 Scheduled with NT17NW 6.03 and NT17NW 22 as Old Dundas Castle, castle, sundial and dovecot. 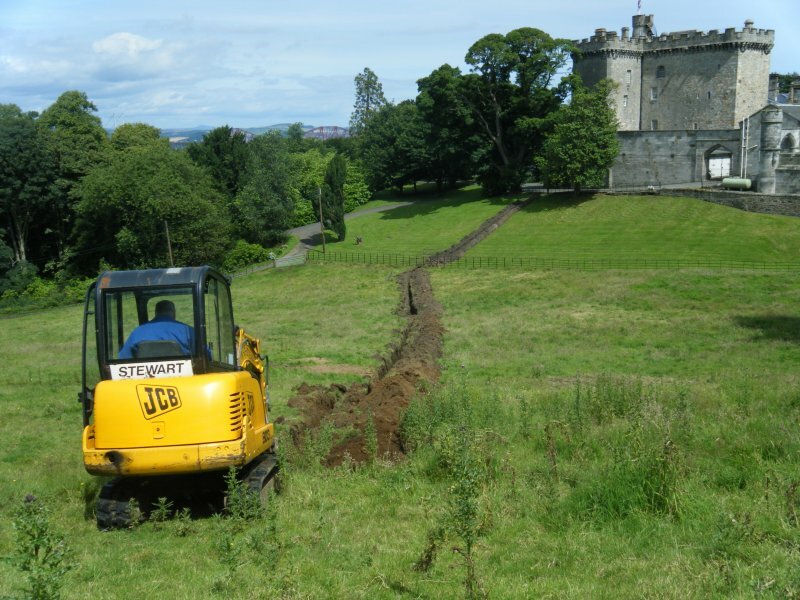 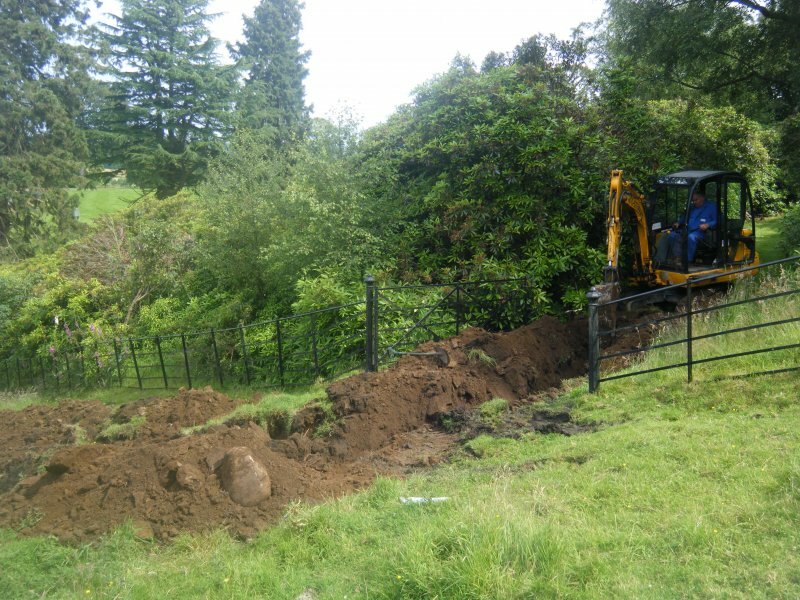 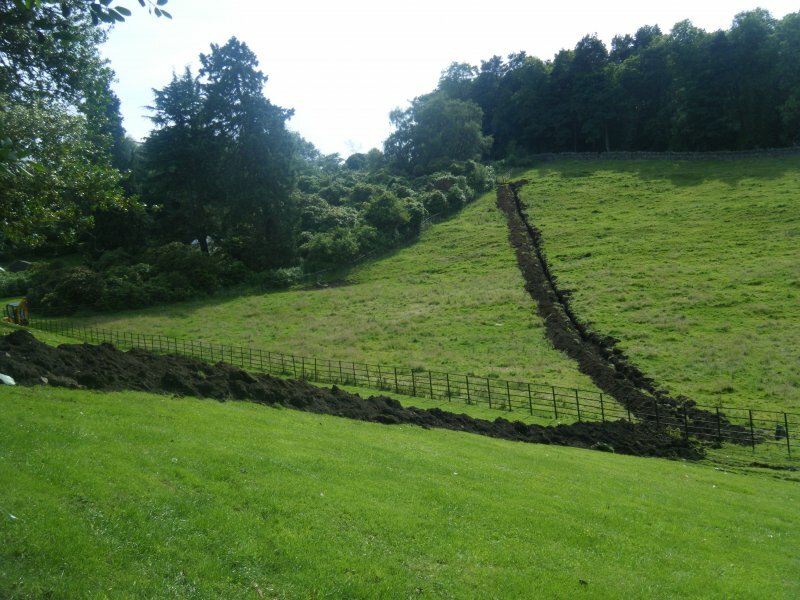 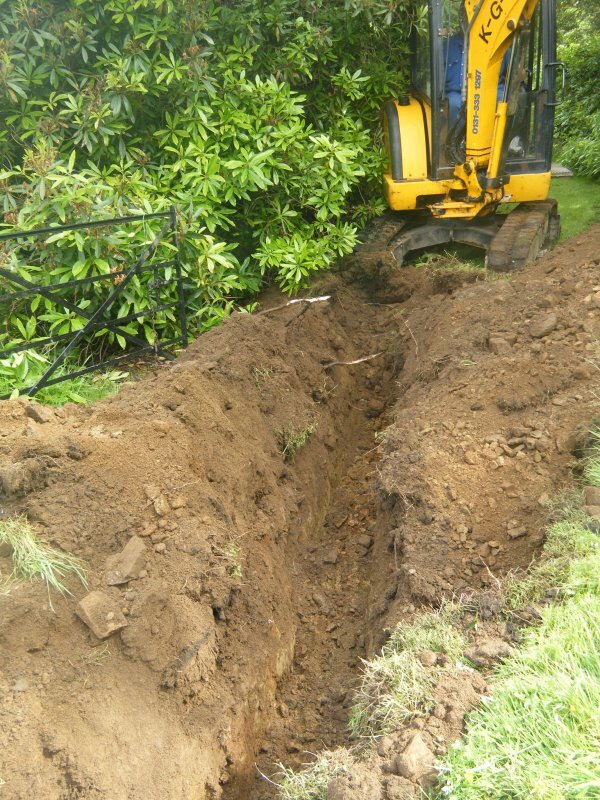 A watching brief on trench excavations associated with the laying of a cable at the site of Dundas Castle in order to identify and record any archaeological remains that might be exposed by the works. 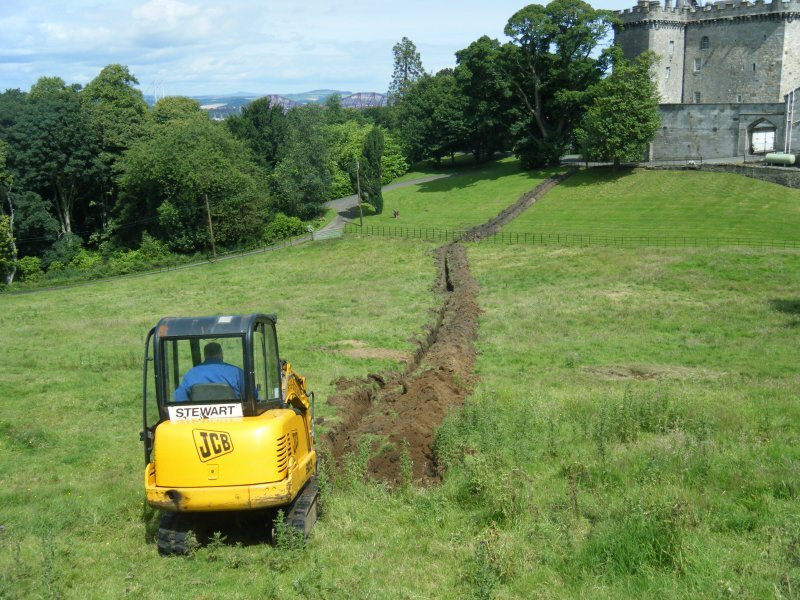 The work was commissioned by Enviko Ltd, and a specification was agreed with Edinburgh City Council. 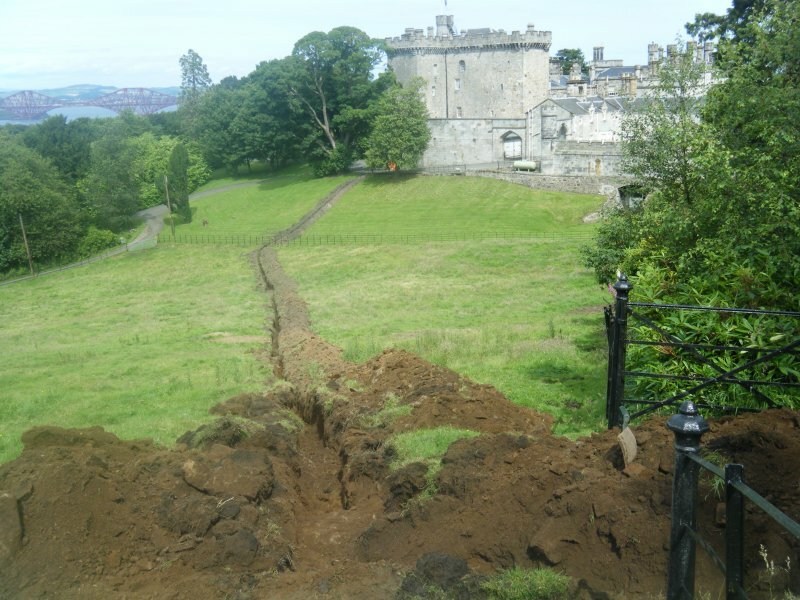 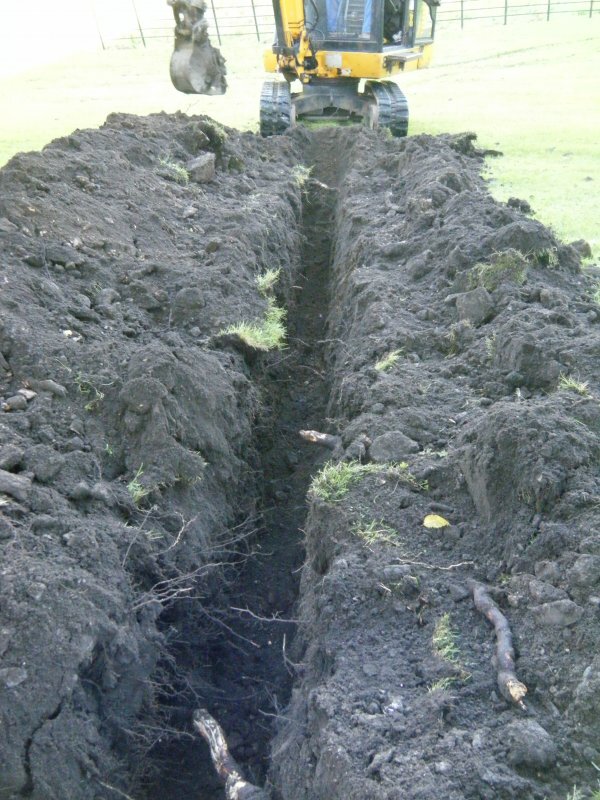 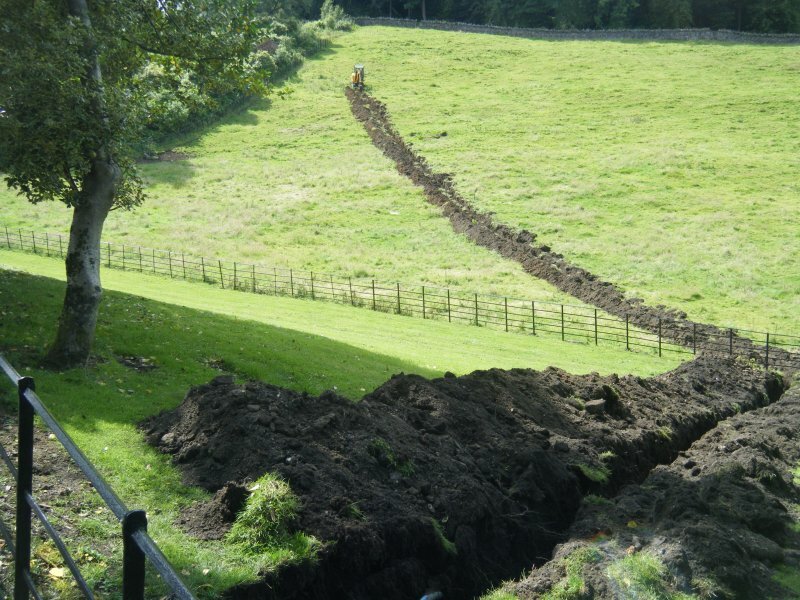 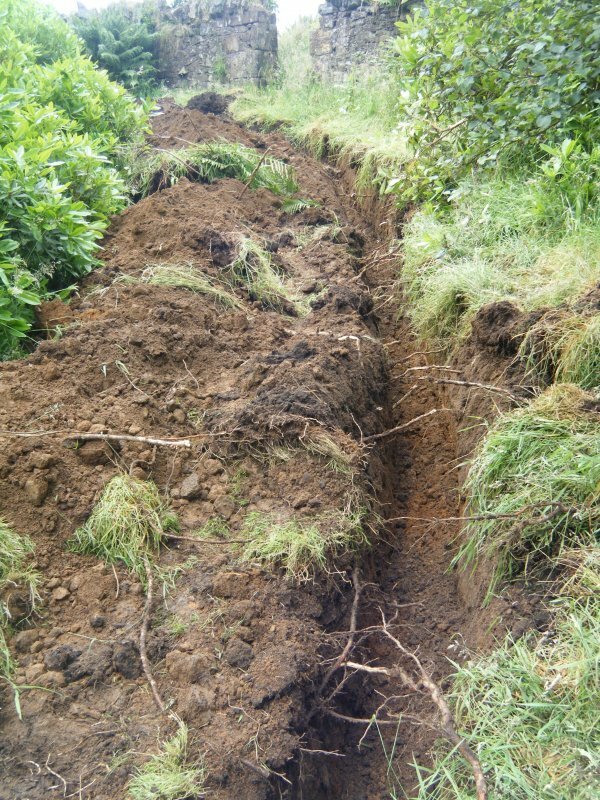 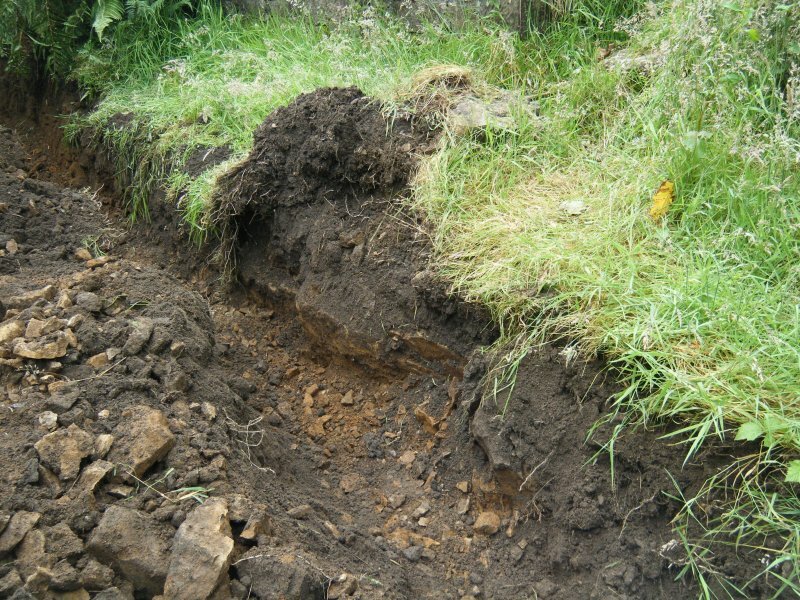 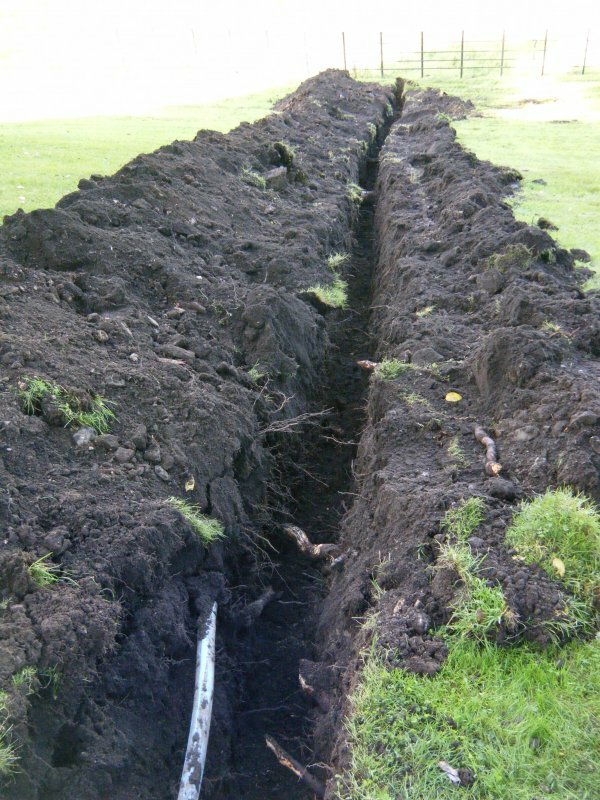 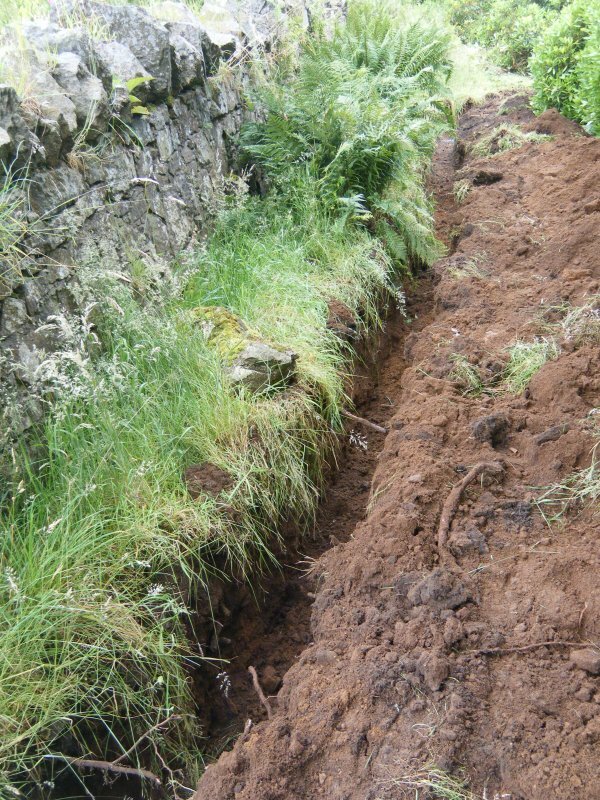 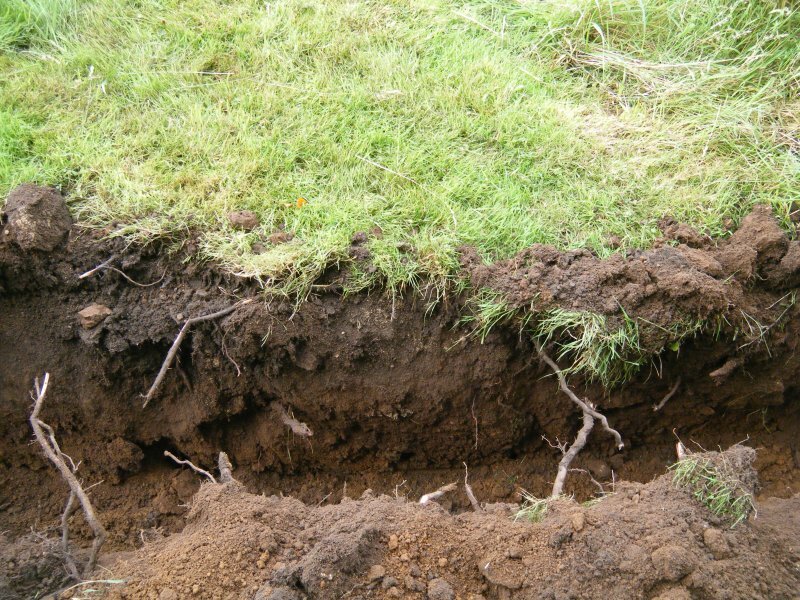 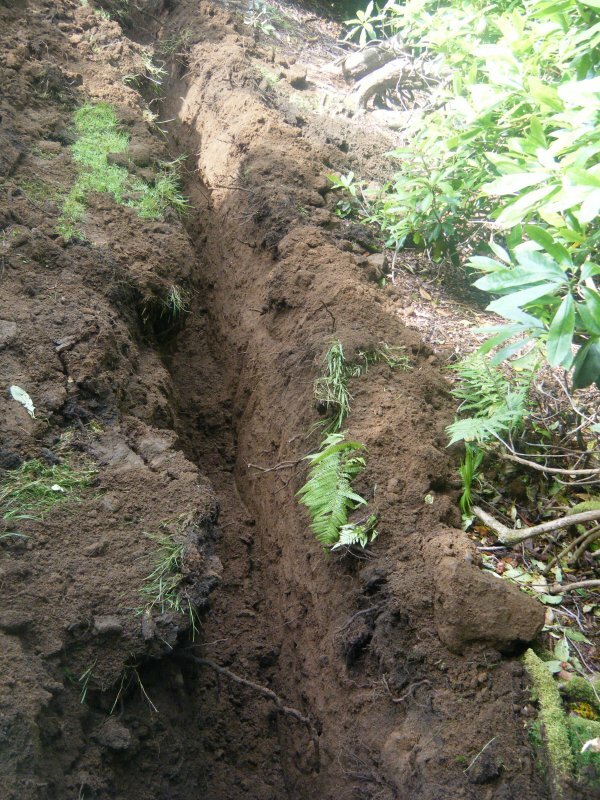 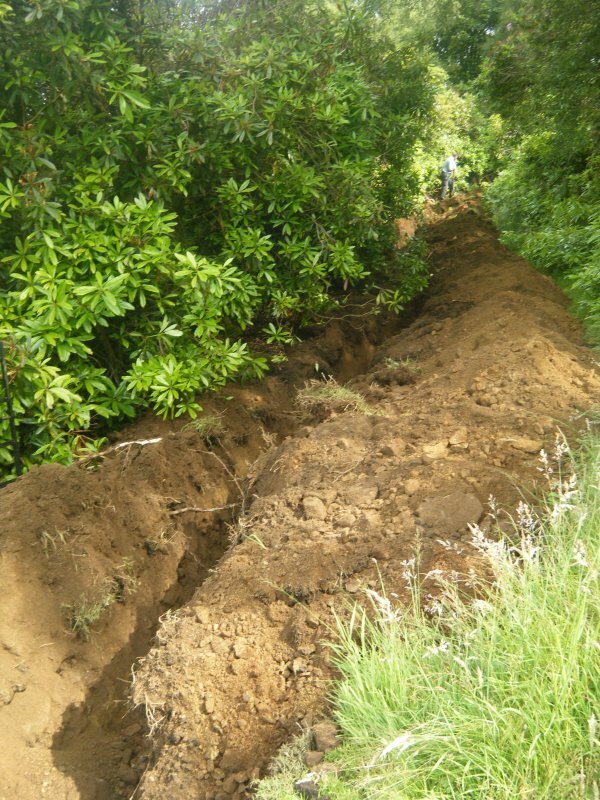 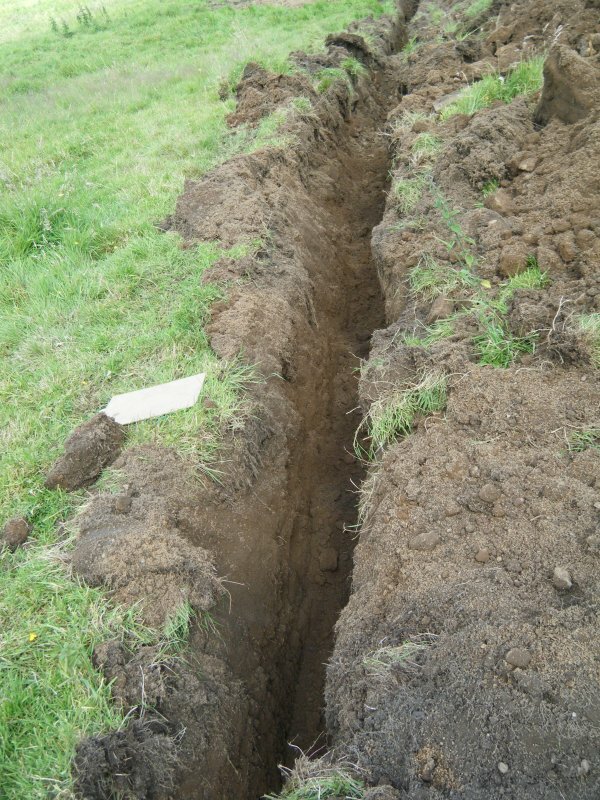 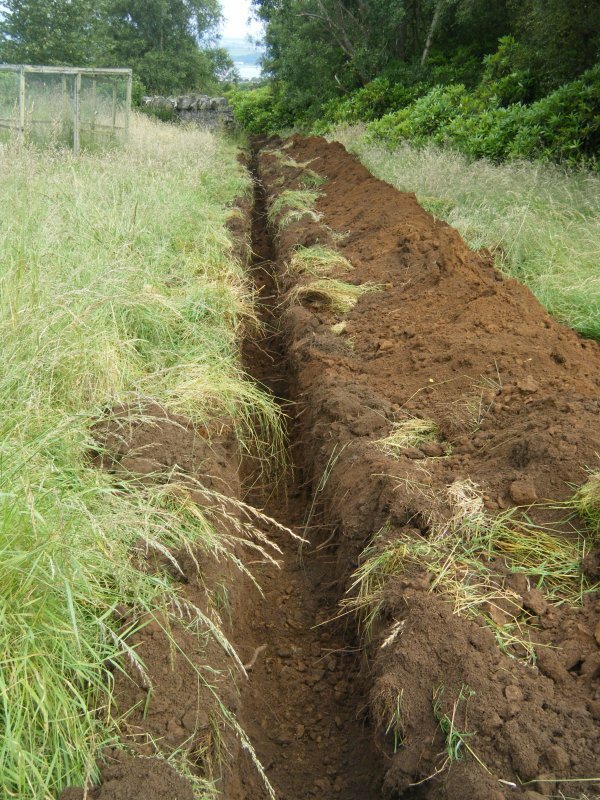 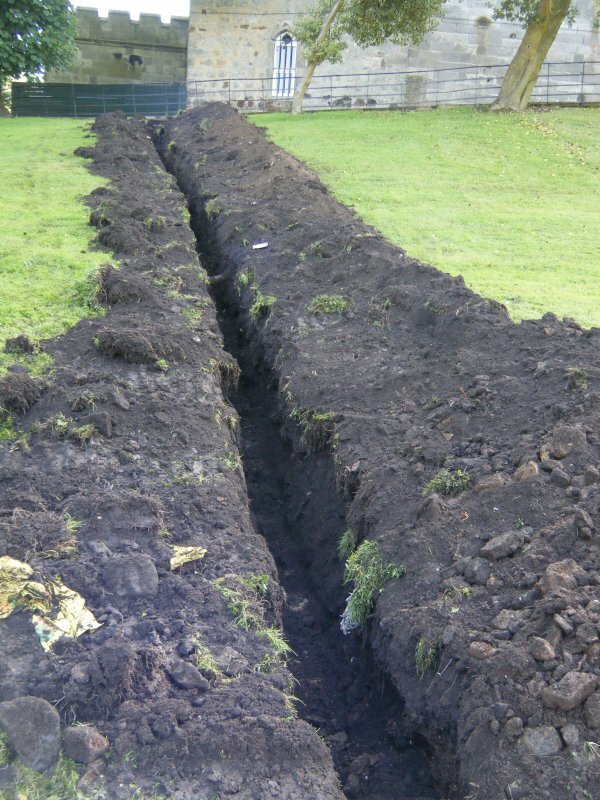 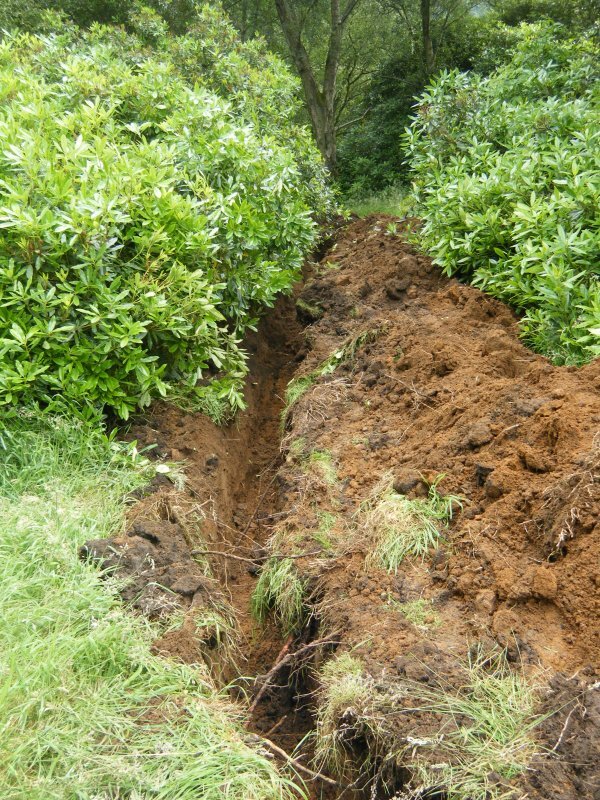 A narrow trench 245 m long across the grounds to the S of the castle was monitored to a maximum depth of 0.9 m. No archaeological features were uncovered during the watching brief.